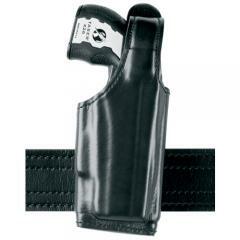 have many tactical holsters to choose from. Walk the beat and conduct patrols with peace of mind knowing your weapon is secured with the 520 EDW with Thumb Break Clip Adjustable Holster from Safariland. Designed specifically for electronic discharge weapons (EDW), the model 520 is ideal for law enforcement agents and tactical professionals. Its custom molded body offers a precise fit and features a wraparound thumb break for added retention security. Safariland's rugged SafariLaminate exterior protects holstered devices from all forms of elemental damage. The thumb break is ergonomically designed to disengage from a natural shooting position so as not to hinder quickdraw or reholstering capabilities. The holster is mounted with a clip-on belt loop with an adjustable cant to offer the perfect carry angle for every user. The model 520 accommodates duty belts between 1.5 and 2.25 inches wide.